Here they are! Clear, text-only descriptions of each of the Advanced Land & Water 2 terms. 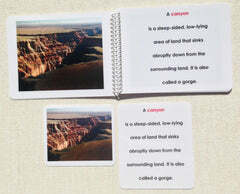 These definition cards match the pages in the Land & Water 2 book, but in this card format, the children get to mix and match. They can play with phrases as if they were puzzle pieces, all while rebuilding the definitions accurately. This is hands-on learning at its best.